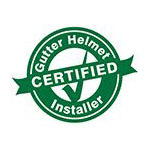 Alamo Area Gutter Helmet is the exclusive distributor for Gutter Helmet in the San Antonio / Austin area and surrounding communities. You won’t have to worry about clogged and overflowing gutters anymore when you have us install America’s most trusted gutter covers for over 30 years on you existing gutter system. We can also offer you seamless gutters. The combination of Gutter Helmet gutter covers and seamless gutters gives you the ultimate in gutter protection. In addition, Alamo Area Gutter Helmet provides repairs, cleaning and inspections of your existing gutters and downspouts. Keeping your gutter system in good repair is an important maintenance task. When gutters become clogged, are sagging, or falling apart, rainwater will leak and can damage your roof, walls, foundation and landscaping leading to expensive repairs. Better to repair the gutter system then have to provide more extensive and costly repairs on your home later. Alamo Area Gutter Helmet also offers our San Antonio / Austin area customers “Handy Man Services.” With these we can provide you with a full list of home repairs and services including shelving, assembly of big box items, audio installation, TV mounting, light switches and outlets, ceiling fans and light fixtures, lawn care and landscaping and much more. If you have questions, please give us a call. For San Antonio area call 210-419-1528 and for Austin area call 512-766-1528. Also, you can fill out our convenient online form. Contact us today and end the tiresome task of gutter cleaning forever!